"In our mini-hacienda you are one half block from the down town central plaza with all the wonderful food, art, shopping and museums you could wish for. At the same time your home base is nestled in a totally contained private home that has been hand-painted and crafted with love and which just "feels good" to be in. We also offer to those family or friends traveling or celebrating together the choice of staying close but of having separate complete spaces when the need or desire arises. In the morning you are footsteps away from the Taos "Main Street Bakery" and the smell of fresh breads and pastries baking - after all, you are on vacation!" 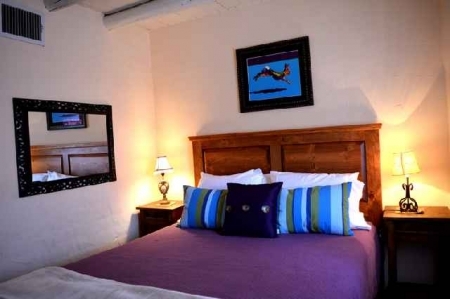 At "Blue Elk Casa" you will be staying in one of the most authentic historic Taos vacation rentals offered in Taos, New Mexico. Come and experience true Southwest charm and architecture with adobe walls, viga ceilings, kiva fireplaces, bancos and nichos! Most important - you are a two minute walk from Taos Plaza and able to enjoy total and absolute privacy from neighbors or passers-by in this serene adobe walled compound.